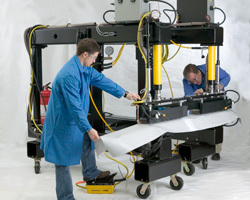 Heat sealed fabric assembly systems are often the key to high performance fabric laminates. At Warwick, we have developed bonding solutions that optimize our advanced flexible laminates in high-strength, low-mass applications, including inflatable aerospace structures and chemical biological soft-sided structures. 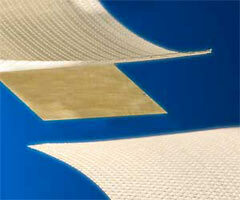 Heat sealed fabric laminate systems can provide high-strength joints for demanding applications. Warwick's fabric bonding methods typically result in joints stronger than the base materials. Where other heat sealed fabric laminate joints can act as the weakest structural point, our bonding method complements the fabric web and enables the maximum performance of the fabric substrate. The combination of tape and bonding techniques of our fabric laminates enhance the tear and damage tolerance in the joints. Properly formed structural fabric joints allow for a greater range of applications.